Data Driven Athlete | The Blog | Does Beet Juice Really Make You Faster on the Bike? Like other dark leafy greens , the special sauce in beets is nitrate (NO3–) . After drinking beet juice, nitrate gets converted to nitrite (NO2–), which is then stored and circulated in the blood as nitric oxide (NO) [1, 4, 5]. NO helps to improve exercise economy and efficiency while reducing fatigue . While many studies support the idea that beet juice can improve cycling performance, others provide compelling evidence that beet juice doesn’t do much . Why the discrepancy? In short, most studies follow slightly different protocols, give varying amounts of nitrate to participants, and have differing participant characteristics. These variables don’t always lead to statistically significant results. If a finding doesn’t reach statistical significance it’s not worth our time right? Not exactly. In the world of sport performance, meaningful improvements often fly under the bar of statistical significance . Think of winning a time trial by 1 second. That second might be under the standard of statistical significance while still making the difference between winning and losing. For this reason, enough meaningful evidence exists to suggest that supplementing with beet juice can make you faster on the bike, provided you follow a few important guidelines . Let’s outline exactly what those guidelines look like. 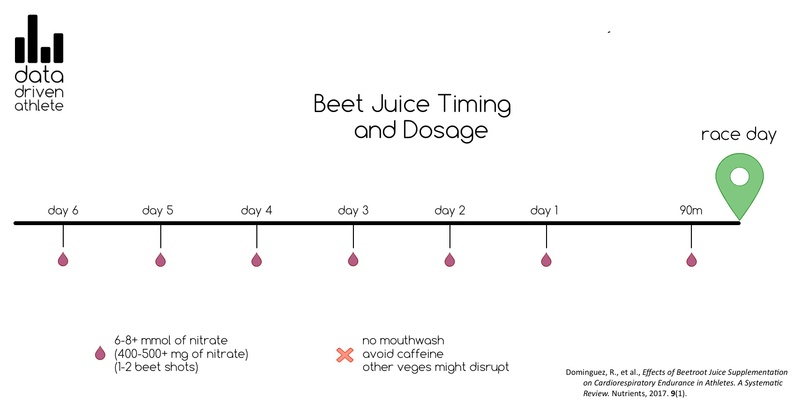 Before you spend your money, let’s revisit two research design variables that remain key to understanding the effectiveness of beet juice: dosage and timing. Current science recommends a quantity of beet juice that contains ≈6-8mmol (≈400-500mg of nitrate) . Research also suggests that high performance athletes might benefit from dosages even higher than the 8mmol range . In a practical sense, that’s a lot of nitrate. Your nitrate doesn’t have to come from beet juice to be effective, spinach and arugula are two other valid options  , but for most people, beet juice is the most convenient and palatable. 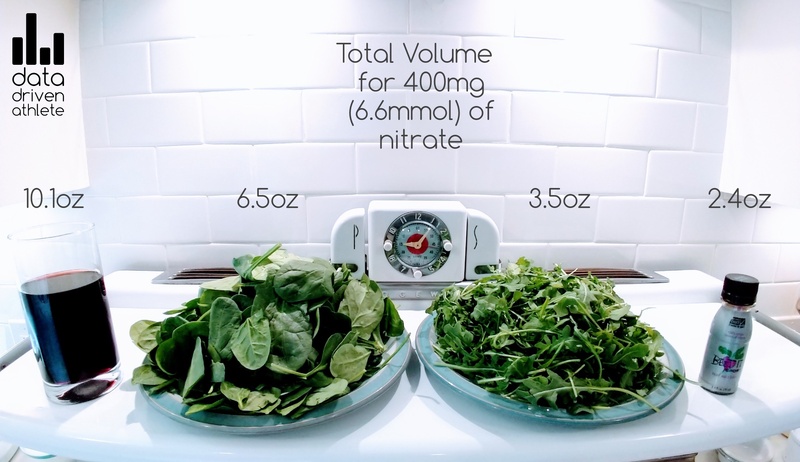 Check out the images below for an example of what 400mg (6.45mmol) of nitrate looks like. Want to drink 6.5oz of blended spinach? Me neither. If you’ve settled on beet juice, the other variable to consider is the wide range in nitrate found between different beets or beet juice products [3, 16]. 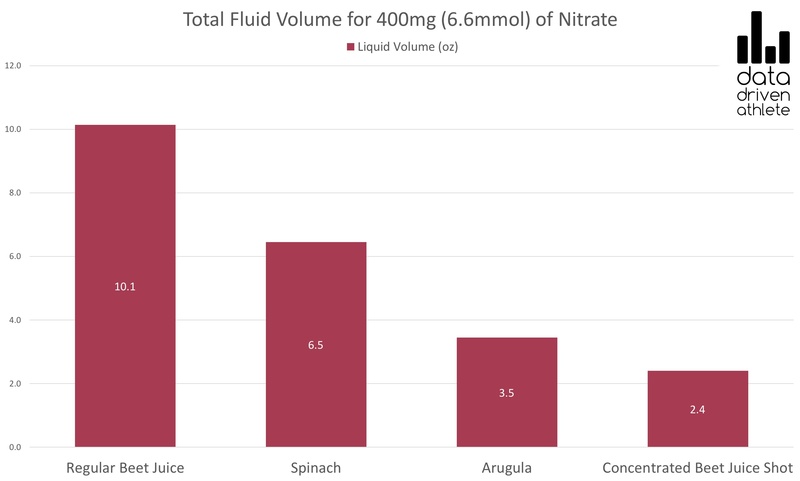 To address this variability in nitrate content, researchers examined 24 of the most popular beet juice products on the market. Not surprisingly, the majority of products fell below our 6 mmol threshold (this study highlights a 5 mmol threshold) . Data from this research can be seen in the graphic below. The takeaway: There are a lot of beet juice products that are most likely a waste of money. Make sure you know what you’re buying. In a practical sense, unless the nitrate content is listed on the product, you have no real way of knowing how much nitrate it contains. If I’m spending good money on a beet product, it needs to have the nitrate content on the label. Beet It concentrated beet juice shots are the most widely used in the world of academic research. No, they don’t pay me to say that. So we’ve settled on a dosage amount (≈6-8+ mmol, ≈400-500+ mg, ≈1-1 1/4+ beet juice shots), when do you drink it? Peak nitrate concentration is obtained about 2-3 hours after consumption, so hitting your beet juice at least 1 ½ hours before your ride/race (acute supplementation) makes the most sense [4, 8]. If you’re wanting to double down on your chance of beet juice success, there’s evidence suggesting that supplementing for about 6 days prior (chronic supplementation) to your key event in addition to the hours before, might give the best chance for a performance boost [9, 10]. When we combine our dosage and timing recommendations, the image below is what we get. As with any other nutrition or training intervention, self-testing is key. Do you get similar benefits from acute and chronic supplementation? Save the money and blast the beet juice only in the hours before a race. Haven’t seen performance improvements from “day-of” supplementation? Experiment with a longer dosage protocol in the week prior to a race. Tried it all and still not seeing results? Try a higher dosage of beet juice. Mouth wash seems to kill important bacteria utilized in the digestion/conversion of nitrate to nitric oxide . In short, don’t get mouthwash anywhere near your expensive beet juice. If you’re supplementing with caffeine before races, beet juice seems to offer no additive benefit, and might actually impede the performance enhancing properties of caffeine . In other words, if caffeine is a regular part of your pre race routine, beet juice might be a waste of your money. Committed to trying both? Experiment with chronic beet juice supplementation then use your caffeine blast on race day. Recent research suggests that other vegetables (specifically kale, cabbage, sprouts, and broccoli) might actually counteract the positive effect of beet juice . It might make sense to consume these vegetables at different times than your beet juice just to make sure. Even though beet juice research contains conflicting results, there is strong enough evidence to recommend beet juice supplementation as a viable strategy to improve cycling performance. To be effective, your beet juice needs to contain a minimum of ≈6mmol (≈400mg) of nitrate. If you don’t know the nitrate value of your product, you might be wasting your money. Spinach, arugula, and regular beet juice are solid options for nitrate supplementation but concentrated beet juice shots are the most practical. One shot contains 6.45 mmol of nitrate. For acute supplementation, drink 1-2 shots of concentrated beet juice about 1 ½ hours before your event. If you’re an elite athlete chasing small margins of performance, going over 8mmol (1 1/4+ shots) of nitrate might be necessary for each dosage. You might be able to enhance the effectiveness of beet juice by supplementing for 6 days prior to your event. Don’t get mouthwash near your beet juice. If you’re already getting jacked on caffeine before races, beet juice might be a waste of your money. Pick one or the other. It might make sense to avoid kale, cabbage, sprouts, and broccoli in meals you’re also supplementing with beet juice. 10/16/18-Added new research on nitrate content in popular beet juice products . 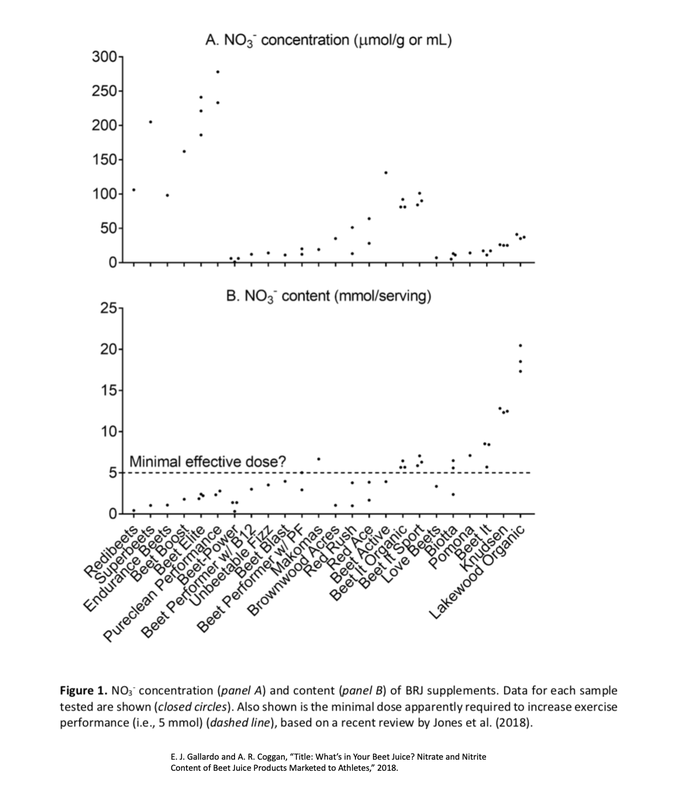 Larsen, F.J., et al., Effects of dietary nitrate on oxygen cost during exercise. Acta Physiol (Oxf), 2007. 191(1): p. 59-66. McMahon, N.F., M.D. Leveritt, and T.G. Pavey, The Effect of Dietary Nitrate Supplementation on Endurance Exercise Performance in Healthy Adults: A Systematic Review and Meta-Analysis. Sports Med, 2017. 47(4): p. 735-756. Lidder, S. and A.J. Webb, Vascular effects of dietary nitrate (as found in green leafy vegetables and beetroot) via the nitrate-nitrite-nitric oxide pathway. Br J Clin Pharmacol, 2013. 75(3): p. 677-96. Dominguez, R., et al., Effects of Beetroot Juice Supplementation on Cardiorespiratory Endurance in Athletes. A Systematic Review. Nutrients, 2017. 9(1). Jones, A.M., Dietary nitrate supplementation and exercise performance. Sports Med, 2014. 44 Suppl 1: p. S35-45. Peeling, P., et al., Beetroot Juice Improves On-Water 500 M Time-Trial Performance, and Laboratory-Based Paddling Economy in National and International-Level Kayak Athletes. Int J Sport Nutr Exerc Metab, 2015. 25(3): p. 278-84. Jonvik, K.L., et al., Nitrate-Rich Vegetables Increase Plasma Nitrate and Nitrite Concentrations and Lower Blood Pressure in Healthy Adults. J Nutr, 2016. 146(5): p. 986-93. Webb, A.J., et al., Acute blood pressure lowering, vasoprotective, and antiplatelet properties of dietary nitrate via bioconversion to nitrite. Hypertension, 2008. 51(3): p. 784-90. Thompson, K.G., et al., Influence of dietary nitrate supplementation on physiological and cognitive responses to incremental cycle exercise. Respir Physiol Neurobiol, 2014. 193: p. 11-20. Kelly, J., et al., Effects of nitrate on the power-duration relationship for severe-intensity exercise. Med Sci Sports Exerc, 2013. 45(9): p. 1798-806. Govoni, M., et al., The increase in plasma nitrite after a dietary nitrate load is markedly attenuated by an antibacterial mouthwash. Nitric Oxide, 2008. 19(4): p. 333-7. Glaister, M., et al., Effects of Dietary Nitrate, Caffeine, and Their Combination on 20-km Cycling Time Trial Performance. The Journal of Strength & Conditioning Research, 2015. 29(1): p. 165-174. Dewhurst-Trigg, R., et al., Lowering of blood pressure after nitrate-rich vegetable consumption is abolished with the co-ingestion of thiocyanate-rich vegetables in healthy normotensive males. Nitric Oxide, 2018. 74: p. 39-46. Jonvik, K.L., et al., Repeated-sprint performance and plasma responses following beetroot juice supplementation do not differ between recreational, competitive and elite sprint athletes. Eur J Sport Sci, 2018: p. 1-10. 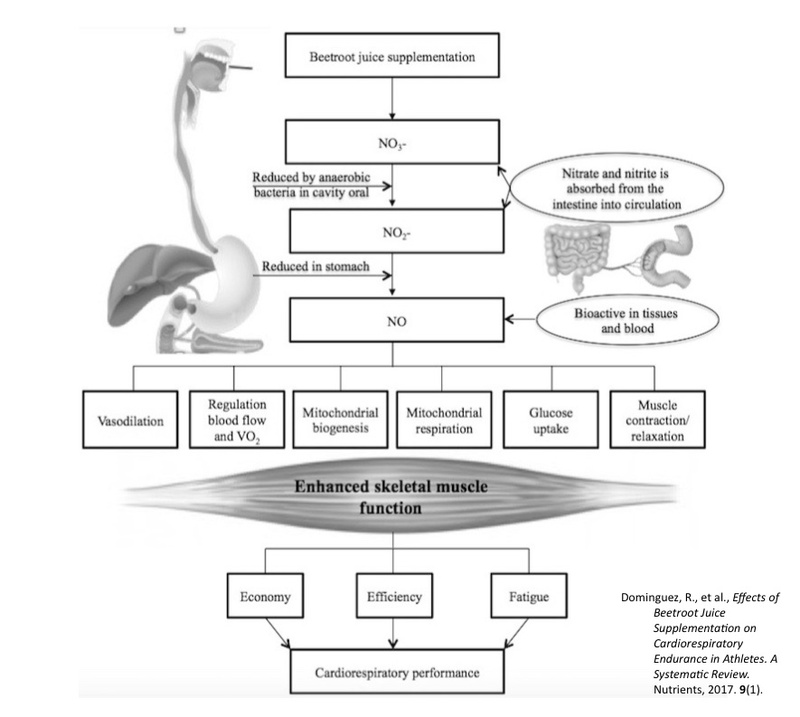 Woessner, M.N., et al., Dietary Nitrate supplementation in Cardiovascular Health: An ergogenic aid or exercise therapeutic? Am J Physiol Heart Circ Physiol, 2017: p. ajpheart 00414 2017. E. J. Gallardo and A. R. Coggan, “Title: What’s in Your Beet Juice? Nitrate and Nitrite Content of Beet Juice Products Marketed to Athletes,” 2018.